Raising kids is expensive -- not exactly a surprising or shocking statement. And furniture to go along with your child's growth – cribs to dressing tables to desks – can represent a hefty part of that expense. According to recent data from the United States Department of Agriculture, a family making about $70,000 a year can expect to spend over a quarter of a million dollars rearing a child from infancy to the age of 17. For families with a household income of $40,000 to $70,000, the estimate of cradle-to-driver's license care is still astronomical, at $180,000. Now, some furniture designers are coming to the rescue....Oji Masanori has channeled his elegant and simple style into furniture that can be used at different stages of a child's life. 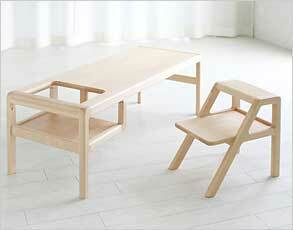 The result is Otomo, a joint project between Japanese furniture maker Toa Ringyo and interior materials firm Sincol. Baby in Table features a cut-out square at one end of a wooden table where infants can sit inside and eat from the same surface as their parents. The table can later function as a desk where toddlers and young school-aged children can let their own creativity flow while sitting on a stool that doubles as a step ladder for all ages. A Brooklyn-based husband-and-wife design duo is behind Oeuf, which offers a stylish, eco-friendly crib-to-toddler bed of a solid birch base and reclaimed MDF wood side panels.They sell conversion kits ($240) that changes their Classic Crib (from $890) to the Toddler Bed (from $570), by simply removing the crib panels and replacing with those from the toddler bed. 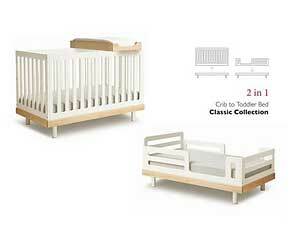 It saves style- and budget-conscious parents the cost of an additional bed. And parents can also convert the piece back to a crib for an another baby down the road.